All BVSF members are aware that in conjunction with the MVDA an extensive investigation was made into the potential of the safe re-use of undeployed airbags. Although we are still, at the time of going to print awaiting a response from the ETC at Thatcham we have received a response from the SMMT which is set out below. It is clear from the response that there is limited knowledge of undeployed airbags and their ability to be tested and re-used from within the SMMT, particularly the suggestion that a “Voltage test” is being carried out, which of course it isn’t as this would be meaningless, the actual test being that of resistance, furthermore, there is no mention of the ability of the scheme to remove from sale untested air bags, perhaps from water damaged vehicles that currently are available on the internet. We leave readers to decide for themselves the document below. “SMMT official response to the study to examine the feasibility of utilising ‘recovered’ SRS components. The reliability of airbags as components, are not in question as it is to be expected that an airbag, designed to operate for years within the vehicle to which it was originally fitted, would remain deployable when removed from one vehicle and put in another. Testing an airbag for its ability to be able to be deployed is not proof that it will provide protection to the occupant in another vehicle that it is to be installed. Therefore VMs remain opposed to any proposal to reuse/recycle airbags, as the safety of the occupant in their vehicles is paramount. Vehicle safety systems and their components are designed to operate together to provide protection in the event of a crash, it is clear that in such a situation the provenance of any replacement part is vital. The provenance of the part, means knowing that it is the right part for the right vehicle, and that it will provide the correct level of protection for the individual when needed. This is very difficult to guarantee with an airbag that has been recycled and the risks are too great to justify using anything other than an OEM part. An airbag is a key part of the restraint systems, not just a slave part as has been suggested; an incorrect airbag or an incorrectly functioning airbag could result in either a serious injury or a fatality. Airbags that appear to be identical can have very different internals, such as the power of the propellant, the way the bag is folded and the size of the venting holes, all of these differences are “tuned” to the original vehicle to provide the required safety performance. Airbags/SRS are finely tuned as an integral part of the whole restraint system, which also includes seats, body structure, steering wheel mounting, ECU algorithm etc. Changes to the design of any these feature may occur during a vehicles production life cycle and as a consequence there is a good chance that the use of recycled airbags would result in the fitting of an airbag not matched with the rest of the restraint system. Knowing the identity of the vehicle that the part originated from is not the same as knowing that it is the correct part for the intended vehicle. New airbags when supplied are supplied as intrinsically safe. The proposed voltage test does not provide this guarantee. 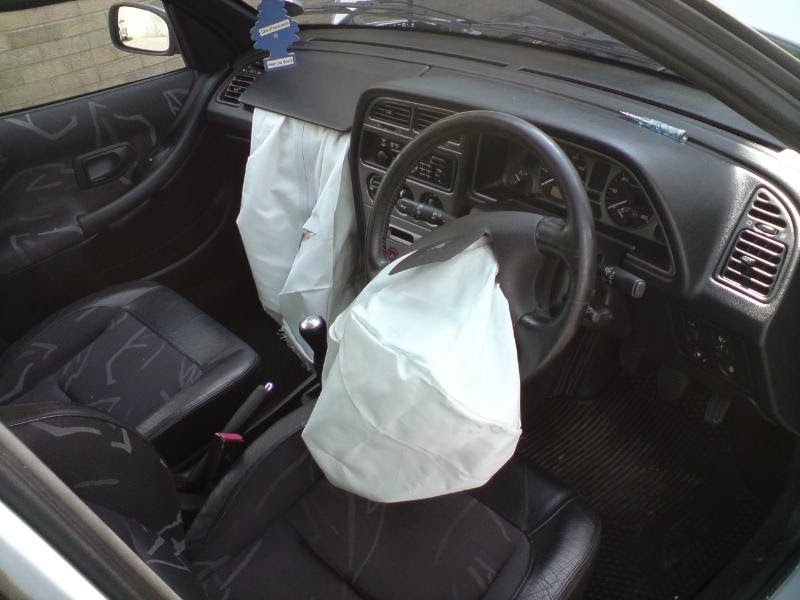 Knowing that an airbag that has apparently not been subjected to water ingress or fire, but has a resistance test that indicates that it would activate in the event of an accident is no guarantee of provenance of the assembly itself, and does not prove its suitability to be used for the safety system into which it is to be installed. New airbags when supplied are supplied in specialised packaging that meets ADR regulations. When a trained VM’s workshop removes an airbag from a vehicle that is un-deployed they can only return it to the manufacturer for safe transport in the packaging that the replacement came in. Dismantlers removing airbags and transporting them safely would need to provide the same quality of specialist packaging for transport. There is no auditable way to be able to verify that the airbags have not been subject to adverse conditions (storage etc) which could adversely affect the inflator mechanisms or the propellant gas used inside them. These faults would not be identified by an electrical resistance check. Maintenance of an audit trail for airbags would be lost in the event of a component recall being necessary. As an example: there is a multi brand recall of airbags on older vehicles about to commence linked to deployment issues in a number of passenger airbags that have been supplied to multiple manufactures by one supplier. The issue here is not failure to deploy but that when these deploy they do so in an unsafe manor that can cause injure and vehicle damage. Risk linked to this is extremely low but sufficient for VMs to be taking action. It would be nearly impossible for a dismantler to identify which airbags are the ones involved in this recall or any recall and therefore they could be selling bags capable of deployment but that are still unsafe to the end user. Fitting original OEM parts is the only way to be able to guarantee the correct function of the vehicles safety system.